The acclaimed actor was born in Aldershot in September 1955 and educated at Rugby School. Following two years in Denmark and Israel (where he grew bananas in a kibbutz!) he studied at the London Academy of Music and Dramatic Art (LAMDA) before becoming a permanent member of the Palace Theatre team at Christmas 1976. 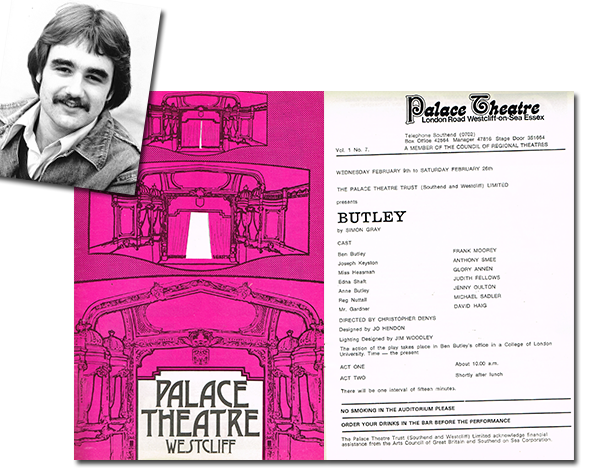 He made his professional debut on our stage in February 1977 in Butley, followed by The Gentle Hook (in which he played a murderer), Joseph and the Amazing Technicolor Dreamcoat and – his final appearance at the Palace, in May 1977 – A Taste of Honey. In 1988 David won an Olivier Award for ‘Actor of the Year in a New Play’ for Our Country’s Good at the Royal Court in Sloane Square. He has appeared in many stage productions in the West End, including Hitchcock Blonde at the Royal Court, Life x 3 at the Savoy Theatre, Journey’s End at the Comedy Theatre and as George Banks in Mary Poppins at the Prince Edward Theatre, for which he received an Olivier Award nomination. He was also nominated for playing Christopher Headingley in a revival of Michael Frayn’s comedy Donkeys’ Years at the Comedy Theatre. In 2010 he played the role of Jim Hacker in the stage version of Yes, Prime Minister. In January 2013, he repeated the role in a remake of the classic 1980s comedy series broadcast on Gold TV. Among his many film and TV roles, David appeared in the 1994 smash hit comedy Four Weddings and a Funeral and had a secondary lead in the BBC television sitcom The Thin Blue Line playing Inspector Grim, the inept foil to Rowan Atkinson’s Inspector Fowler. In 2007, he appeared in a Comic Relief sketch “Mr. Bean’s Wedding” as the bride’s father, reuniting with Rowan Atkinson. David was appointed Member of the Order of the British Empire in the 2013 Birthday Honours for services to drama. He has five children with his wife, Julia Jane Ramsay Gray (who acts as Jane Galloway) and is a patron of SANDS, a charity which deals with stillbirth and neonatal death.